You are currently browsing the tag archive for the ‘Eliza Dushku’ tag. What if you could do anything, be anyone, and nothing you did ever had any consequence? Take one part Quantum Leap, one part Charlie’s Angels, add a truck load of Joss Whedon’s imagination, and you’ve got one hell of a show. If you missed the first season of Dollhouse, you’re in luck because the DVD is out now, and it’s time for you to play catch up. A few of my friends tuned out after episode three, but as I told them, you really need to hang in there till episode six. Episodes one through five are basically stand-alone episodes, to please the network I would imagine, but episode six is a real game changer and is truly where the series shows it’s full potential. 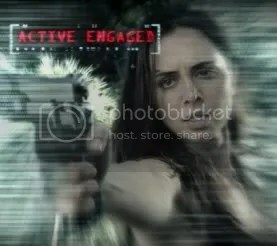 In Dollhouse we follow Echo, played by Eliza Dushku, a seemingly unwilling Active in the Dollhouse, an underground organization that for the right price will program human beings to fit your every need or desire. Actives have had their brains wiped, and are imprinted with new personalities, and abilities, that allow them to become anyone or anything to achieve their objective. What illegal underground organization would be complete, with out an obsessed F.B.I. agent determined to bring them down? Agent Paul Ballard, played by Tahmoh Penikett, finds himself filling that role, and the deeper he digs the more entwined he seems to get. When we first get to the Dollhouse, an Active, codename Alpha, has gone rogue, and in the process has left a trail of bodies in his wake. For some unknown reason Echo was spared. But, that’s not the only unique thing about Echo. She also seems to be retaining, or recalling memories while in her wiped doll state, raising the question, can you ever truly clean a slate? This show is a dream on so many different levels. For one, it’s an actor’s dream, because they can be a doctor, a lover, a spy, an assassin, or maybe just someone there to help someone that can’t help them self. In episode four, Eliza Dushku and Dichen Lachman play the same character, when Echo and Sierra get imprinted with the same imprint. Two actors playing the same character, with the same traits and speech pattern at the same time! This is what truly makes this show unique. The cast is amazing! The amount of talent on this show, in front of and behind the camera, truly boggles the mind. The other thing about this show is that it raises smart and intelligent questions dealing with morality. Whether it be slavery, human trafficking, or just basic human rights, Dollhouse once again enforces the belief that mankind will always exploit and abuse any and all technologies they discover. I think the part I liked the most about re-watching season one, was knowing all the twists and turns, and being able to see things I might have missed the first time around. I’ll say it once again; Dollhouse is an amazing television series! Don’t believe me? Well, why don’t you get the DVD, and tune-in to Dollhouse season two this year, and see for yourself? Feel free to thank me later. Joss Whedon and Eliza Dushku do a commentary track for “Ghost,” where they talk about the show’s shoe budget, and while Eliza’s strawberries maybe loud, Joss’ tummy commentary is louder. Joss Whedon does a commentary track for “Man on the Street,” and talks about the importance of the turning point in this episode. I would have liked a few more commentaries on some more key episodes, but three is better than none. The infamous unaired 13th episode stars Felecia Day and Zack Ward, and takes place in 2019. I would suggest not watching this episode if you want to be surprised by the upcoming relationships and events of the Dollhouse series. It doesn’t tell you the hows and whys, but it does show you things they hope to do with the series. Could be a spoiler for some; you’ve been warned. This is the pilot episode that Joss pulled the plug on and thus decided to take a three week hiatus to rethink the show opener. I for one am glad he did. The episode moves too fast and gives away way too much. But, it wasn’t a complete loss, because they ended up cutting it up and sprinkling bits and pieces here and there throughout the season. The Cast & Crew share their stories and memories of working on other Joss Whedon shows, Buffy the Vampire Slayer, Angel, Firefly, and Dr. Horrible’s Sing-Along Blog. A look at Eliza Dushku’s important role as producer and star, and how she and Joss developed the idea for the show. Joss Whedon takes us on a tour of the soundstage that houses the Dollhouse. The Cast & Crew talk about what their ideal doll would be.